Furniture makeovers are one of the cheapest way to change things in your home! I love to take an outdated piece of furniture and turn it into something I fall in love with all over again! There are so many ways to makeover furniture so that is why we are kicking off the first week of July with these awesome painted furniture makeovers! I can’t wait to share them with you! This weeks link up theme is bedroom furniture makeovers so don’t forget to link up you favorite piece for this weeks party! Have you done your own painted furniture piece yet? 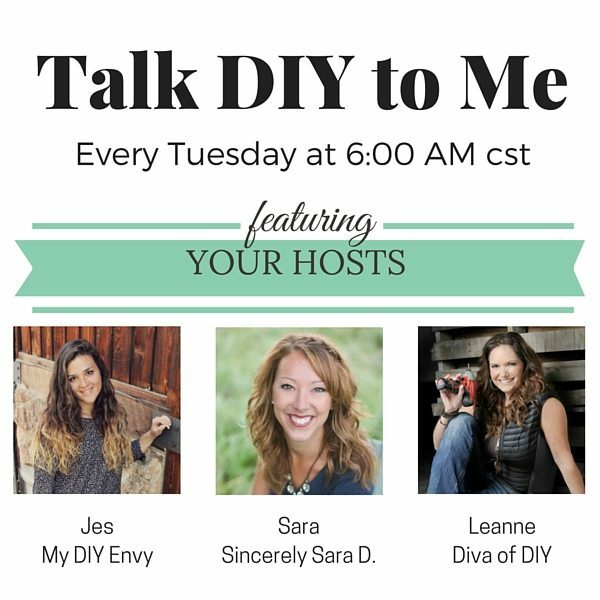 Here are our favorites Talk DIY to Me #5, I hope they inspire you to try it out! First up we have this awesome painted drink station table. Ok, so it wasn’t exactly a makeover because, can you believe it, she built it! You can even get the plans to make one yourself! You can find them on Houseful of Handmade. We also really loved this TV console made from a dresser. What a great idea, tons of storage for movies and games. You can get the details over at Small Home Soul. I think the color on this sewing desk makeover is fabulous – it was the most viewed this week! Check out this desk and more over at The Weathered Fox! Round of applause for these fabulous features! Don’t forget to grab our Featured Blogger button for your post or sidebar! We love sharing your work each week so please keep them coming! Below you will find all of the fabulous painted furniture makeovers from last week’s Talk DIY to Me link party. If you missed any of these amazing makeovers be sure to check them out! Next week we will feature DIY bedroom furniture ideas! Check back throughout the week as some amazing bloggers link up their bedroom furniture ideas. Bench Makeover – Simply Sara D.
Painted Headboard – Sincerely Sara D.
That's great news Sam! I can't wait to see what you come up with!